Sometimes emojis can be a little hard to discern ("That wink, he probably means it in a cheeky chappy kind of way, when he's actually coming across as a complete tool"). But this one leaves everyone in no doubt what you're thinking. It sticks a middle finger up at the person you're conversing with. And soon you'll be able to use it on Windows 10. The gesture became an official emoji last year but so far neither iOS nor Android has included it in their selection of gestures. Can't think why. But now, according to Emojipedia, Microsoft has added support for it in Windows 10. Emojipedia describes the gesture as "reverse hand with middle finger extended". We prefer sit and swivel, or flip the bird. Microsoft will offer the emoji in all different skin tone options, including grey – the default colour – pale and black. Hence the picture at the top of this story. It's like a vision of racial harmony. Windows 10 will display emoji people as nonhuman in appearance, with grey skin. Google and Apple both use bright yellow as the default skin tone. 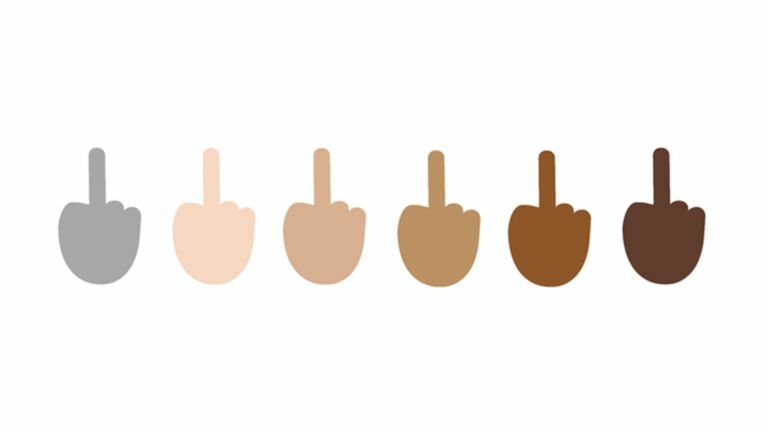 Apple recently added a more diverse collection of emojis, though stories quickly emerged of people using them to post racist comments. So which emojis should be next? We'd like a 'chinny reckon', definitely. Maybe the Italian-style, raised fist, slap the inside of your elbow gesture too, that would be a good one. And what's wrong with a good old-fashioned knob head?